The gateway between the Atlantic and Pacific at the bottom of the globe opened up 41 million years ago, according to a study of old fish teeth. The research in Science pushes back the date of the forging of Drake Passage to twice as long ago as once thought. US geologists believe it kick-started the ocean current that swirls around Antarctica, helping to bring about a dramatic cooling effect. The continent was transformed from lush forest to the icy landscape of today. "We're saying we now have a date for the opening of the Drake Passage that looks like it's early enough that it may have contributed to the cooling," said Ellen Eckels Martin of the University of Florida, US. "It illustrates that ocean circulation may play a very important role in climate change." Millions of years later, the current still plays a major role in keeping the Antarctic cool. 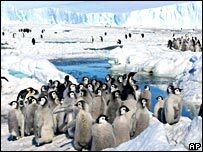 "We are warming the world through greenhouse gases and this is leading to the decay of the West Antarctic Ice Sheet and the cool current around Antarctica is probably helping slow that process," said Dr Martin. Drake's Passage is named after Sir Francis Drake, the English sea captain who circumnavigated the globe in the 16th Century. 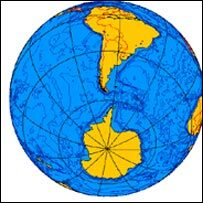 The treacherous stretch of water between the southern tip of South America at Cape Horn and the South Shetland Islands of Antarctica formed when the "arm" that once connected South America and Antarctica fell away. The world was a very different place then. Levels of carbon dioxide were three to four times today's levels and it was so warm that alligators sunned themselves in the high Arctic. But some 30 million years ago, there was a dramatic shift in climate from "greenhouse" to "icehouse". The rapid cooling swept over the Antarctic and, over the course of several million years, its pine trees were replaced by glaciers. Scientists have long speculated about how this happened and suspect the opening of the Drake Passage played a key role. But until now, the date has been fuzzy, with estimates ranging from 15 million to 49 million years ago. 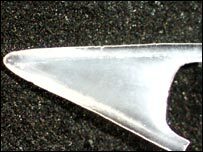 The University of Florida team came up with a reliable date by studying fish teeth recovered from rocks lying more than 300m (1,000ft) beneath the bottom of the Atlantic Ocean. A chemical called neodymium accumulates in fish teeth, as they settle on the ocean floor. The chemical signatures for the Atlantic and the Pacific are different, allowing the scientists to determine when water from the Pacific Ocean began seeping into the Atlantic Ocean. The research shows that the rift in the plates of the Earth that caused the gap to open up happened about 41 million years ago, which fits in with the build-up of ice sheets on Antarctica a few million years later. Scientists believe the formation of the ocean current that circulates around Antarctica played a key role in the cooling as it deflects warm streams of water coming from the equator. Decreasing levels of carbon dioxide in the atmosphere may have also contributed to the cooling effect, but their relative roles are still a matter of debate.